There was something special about this weekends full Moon, which you may have noticed if you were outside and not dealing with severe cloud cover. 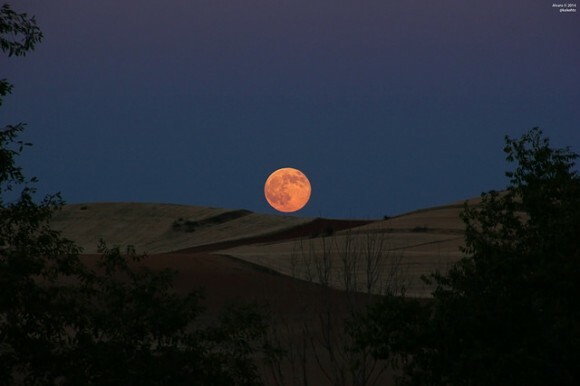 It was a July “Buck” Moon, or what is known as a Supermoon, when the Earth’s only satellite is at perigee – its closest point in its orbit to Earth – while its also full. And interestingly enough, it was the first of three Supermoons that is expected to happen this year. As for myself, I was out walking in Esquimalt with my wife and her stepbrother, checking out his new pad and looking to see if there were any properties we might consider buying ourselves in the near future. As we walked, we caught sight of a rather bright and large moon hanging just above the city skyline. Not only was it full, it was a light brown color and appeared larger than at any time I had seen it in recent memory. As the evening went on, the Moon drifter higher into the night sky and grew smaller. It’s color also changed as it ascended, going from light brown to bright blue-white. But it’s brilliance was not diminished, and the wife and I walked home beneath a night sky that still seemed to possess some daylight. Needless to say, it was quite the magical evening, warm and mild and illuminated by an intensely bright Moon. Technically speaking, a Supermoon is not radically different from a regular full Moon. But for people who outside this weekend and gazing at the horizon, the moon would have appeared rather large and light brown in color. And around the world, many people took notice and captured shots of the moon with their cameras and smartphones. And as usual, Universe Today was on hand to collect these images and compiled them into a Flickr Gallery. However, this month’s big full Moon was not the closest the terrestrial satellite will get to to Earth this year. The closest Full Moon of 2014 will occur next month on August 10th at 18:11 Universal Time (UT) or 1:44 PM EDT. On that date, the Moon reaches will reach perigee – or its closest approach to the Earth – at a distance of 356,896 kilometres at 17:44, less than an hour before it’s full. Be sure to head on over their Flickr Gallery to see how the Moon appeared from different vantage points around the world. High in the sky, or low on the horizon, it was certainly an inspiring sight!